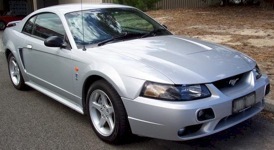 Limited to 100 units and all shipped to Australia, the 2002 SVT Cobra Mustang came with a special Cobra 320hp (at 6000rpm), 281 cubic inch, 4.6 liter, electronic fuel injected, double overhead cam, V8. 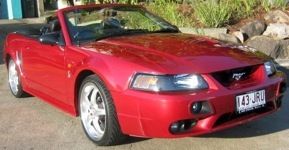 Just as in 2001 the 2002 Cobra came in 8 of the standard 2001 Mustang colors (not the greens), sport seats, power equipment group, rear spoiler, polished wheels, and Cobra letters emosed on the rear bumper. Conversions for Australia included fender reflectors (behind the front wheels), extra driving lights in the front bumper, and right-hand-drive (of course).